Hey there guys, long time no see! PonySFM is approaching almost 900 SUBMITTED RESOURCES and over 780 UPLOADED FILE REVISIONS! THAT'S INSANE and we wanna thank you all for creating Source Filmmaker related pony stuff, it helps the community a lot! Well, 900 Resources is a lot, far more than a team of 3 people could handle to keep updated. We constantly try to find popular resources, search for new revisions, upload them, keep them updated and archived that way. In some cases this even saved some models or scripts from going extinct and simply vanishing into the deep, dark nothingness despite being used by hundreds of people! We're trying to implement automated scripts which search already submitted DeviantArt URLs for new revisions but even that isn't 100% accurate since some people simply don't use DeviantArt's own upload system due to size limits and DeviantArt isn't offering a good API to begin with. We want to ask YOU, the various amazing resource creators out there, to help PonySFM to upload and maintain your own creations if possible! Now we do understand that some simply don't want to register on a new site and that's okay, but even if just a bunch of you guys actually register and maintain their own resources here and open the ways for hundreds if not even thousands of other interested people starting with Source Filmmaker, it would already help a ton! If you do decide to register and help us and already find your resource submitted to this site, please throw us an E-Mail at contact@ponysfm.com with a link to the resource, your PonySFM username and proof that it's actually you. This can either be a link to your DeviantArt profile with a short text in your bio like "PonySFM: username" or any other way you (and we) think is enough proof. We can then assign this resource to you so you can start editing and uploading new stuff to it! 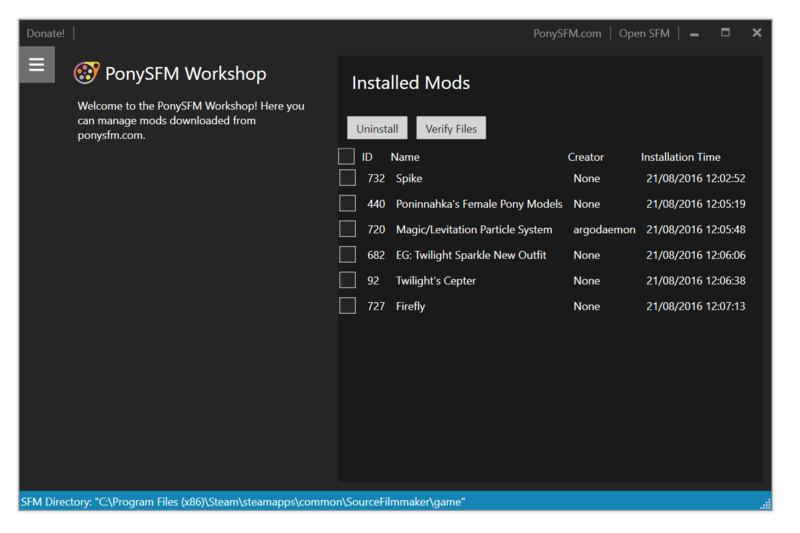 After working with the wonders of software within our fingertips, we are pleased to announce PonySFM Workshop, an app that supersedes our older, console-based mod manager. Tope beta phase is open to suggestions, bug reports and so on and we hope the app will please both the eye and the ease of use, featuring more up-to-date visuals found in today's newer applications. Most credits go to Nuke928 for the foundation, the mechanics, and most of the User Interface. My contributions were also of grand aid, as I mostly help for the UI (a lot) and some other functionality within the app. You might saw that our website was down for almost a whole day yesterday and we're sorry for that. Our server hoster had 3 vNode crashes over the last 2 weeks where the last one completely destroyed our server. We had to reinstall our server completely from scratch. Luckily we had backups from the day before (we generate backups at 2 AM each day) so it wasn't as bad as I first thought it would be. To prevent such a thing from happening again I'm currently thinking about starting a donation pool or something similar (maybe Patreon?) so we can get a second server for redundancy, right now I (EpicLPer) am paying everything out of my own pocket. But that's something I'll have to talk about with my team. Anyways, sorry again for the downtime yesterday, I really hope that something like this won't happen again. Also a huge thanks to Nuke928 for setting up the new server and getting it up and running in less than 2 hours, awesome! Ever thought "Hey, I have some really nice ideas for this website!" but never knew where to send them? You can now send us your very own, personal ideas on how to improve PonySFM! You have a tiny little idea on what to improve? Just send it! A new feature request many would probably love? Just send it! A design idea that would make some things easier? Just send it! I think you get what I mean now. We'll always be happy to hear what things you're thinking about.